Advisors with a custodial relationship with TD Ameritrade Institutional can now use the Invessence digital wealth management and robo-advisory solutions. Integrating with TD Ameritrade Institutional’s automated, fully digital account-opening process allows advisors a greater choice in building out their digital solutions. Invessence, Inc., a digital wealth management technology provider, now offers seamless integration of its AdvisorGo and AdvisorCustom platforms with Veo®, TD Ameritrade Institutional’s brokerage and custody platform. Invessence is a business-to-business provider of wealth management technology solutions to asset managers, broker-dealers, and advisors globally. “Integrating with TD Ameritrade Institutional’s automated, fully digital account-opening process allows advisors a greater choice in building out their digital solutions,” said Jigar Vyas, CEO of Invessence. 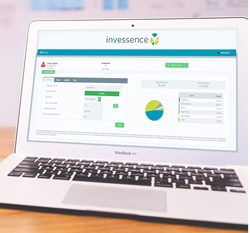 Invessence’s white-labeled technology provides advisors a comprehensive wealth management platform to deliver their investment solutions at scale. It improves advisor efficiency by automating client registration, portfolio management, account administration and reporting processes into a streamlined online solution. “The uniqueness of the Invessence technology is its flexibility,” said Prashant Mehta, CTO of Invessence. The technology allows advisors the ability to create their own investment portfolios, risk profiling, client portal and advisor dashboard. It is available as a turnkey solution for individual advisors, as well as a customizable platform for larger enterprises. To learn more about Invessence, visit: http://www.invessence.com. Invessence, Inc. is a business-to-business provider of digital wealth management technology that enables asset managers, broker-dealers and advisory firms to deliver their investment solutions at scale. It provides a dynamic user experience for both the advisor and investor by simplifying the investing process into a streamlined digital solution. Invessence provides services globally. TD Ameritrade Institutional is a leading provider of comprehensive brokerage and custody services to more than 5,000 fee-based, independent registered investment advisors and their clients. Our advanced technology platform, coupled with personal support from our dedicated service teams, allows investment advisors to run their practices more efficiently and effectively while optimizing time with clients. TD Ameritrade Institutional is a division of TD Ameritrade, Inc., a brokerage subsidiary of TD Ameritrade Holding Corporation. Brokerage services provided by TD Ameritrade, Inc., member FINRA /SIPC.